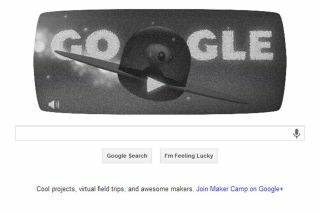 The "Google Doodle" of July 8, 2013 nods to the 66th anniversary of an unidentified object crash landing on a ranch near Roswell, N.M.
Any space fan should visit Google.com today. The search engine is commemorating the 66th anniversary of the "UFO" incident in Roswell, N.M., with a quirky alien doodle game. The game is a tongue-in-cheek nod to what may be the most famous "UFO" sighting in history, when an unidentified object crash-landed on a ranch near Roswell on July 7, 1947, sparking rumors of an alien visitation. Conspiracy theories have never been fully extinguished by the U.S. government's claim that the object was a military surveillance balloon. Google's doodle is an entertaining black-and-white animated game that puts you in the shoes of a stranded extraterrestrial whose flying saucer has crashed. If you can gather the spread-out pieces of your spaceship from around the ranch landscape, you can leave Roswell and lift off again toward your home planet.